Boosted by the demand for signatures of the newly crowned World Champion and Finals MVP, Dirk Nowitzki, Panini brought the exciting German in to sign items for their Panini Authentic line of memorabilia. 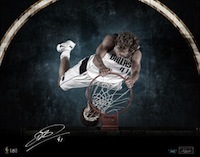 The signatures are made even more special by the fact that Nowitzki has not signed many official autographs. He has around 100 different certified signature cards throughout his entire 13-year career, many of which are extremely tough to find. While this number may seem high to some, for a player of his caliber it is actually somewhat small. Nowitzki made two recent visits to Panini for private signings that included items for both Panini and the Dirk Nowitzki Foundation. For Panini, Nowitzki signed exclusive Panini Authentic 16 x 20 photographs from the series win over the Miami Heat as well as a small amount of Panini trading cards. The images feature pivotal moments in the series and carry such dramatic titles as "Seconds," "The Moment," "Authority" and "The Dagger." All photos are limited to 50 except for "Seconds," which is limited to 25 copies. The photos can be viewed and purchased at the Panini Authentic website. Additional images of the signings can be seen on Dirk Nowitzki's Facebook page, which were released in real-time to his fans. The pictures show the superstar still sporting bandages on his middle left finger from a torn tendon injury he sustained in the Game One loss to the Miami Heat in the NBA Finals. Dirk Nowitzki capped off a great regular season by tearing through the NBA Playoffs and leading the Dallas Mavericks over the heavily favored Heat and their "Big Three." The feat was made all the more impressive by his 101-degree fever in Game Four to go along with the torn tendon that he dealt with during the series.